Don’t Just Go Sticking That Anywhere: Protect the Precious With a USB Wrapper « Adafruit Industries – Makers, hackers, artists, designers and engineers! 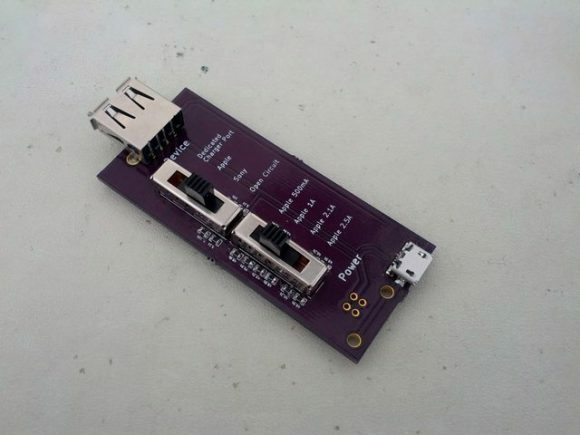 This USB Wrapper protects your data from being hacked at public charging stations without slowing down the charging process, from hackaday. Oooh, look, a public charging station. Should you trust it? You might get juice jacked. Oh wait, you’ve got a USB Wrapper designed by [Scasagrande] to deny access to your datas. This project was inspired by the USB Condom, but the problem with those is that they completely cut out the data lines and limit the charge rate to USB 2.0 (500mA). The data lines are used to communicate information about the charger’s power sourcing capabilities to the device. Many manufacturers short D+ and D- together, but Apple applies specific voltages to those lines. [Scasagrande]‘s USB Wrapper gives you options. You can set it to Dedicated Charging Port, Sony, Open Circuit, or Apple. The super-cool part of this hack is for you Apple fanboys. The bottom slider lets you emulate any Apple charger and use any USB cube (including one you may have made) as long as you have that funny cable in your messenger bag. The hardware is open source and available at [Scasagrande]‘s repo. Make the jump to see [Scasagrande]‘s nicely detailed video about the project.